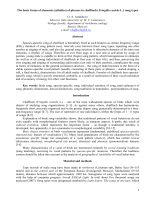 ISSN 0096 3925, Moscow University Biological Sciences Bulletin, 2010, Vol. 65, No. 2, pp. 78вЂ“83. В© Allerton Press, Inc., 2010. Original Russian Text В© O.A. Astakhova, I.R. Beme, 2010, published in Vestnik Moskovskogo Universiteta. Biologiya, 2010, No. 2, pp. 40вЂ“45. AbstractвЂ”The song repertoire of many sparrow species (Passeriformes) has not one but several song types. by us can speak for genetic heterogeneity. 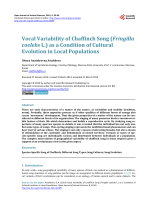 Key words: chaffinch (Fringilla coelebs L.), song, song types, variation in song types. individuals , and record points were mapped. preparation and course of the reproductive cycle. can have not one but several song types [4вЂ“9]. 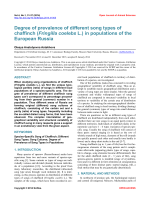 and geographical variation in songs [9, 13вЂ“15]. ture in the species of the population have been noted. Fig. 1. The map of the Curonian Spit. Fig. 2. Structure of the chaffinch song. all three phrases (Fig. 3.2). R R E2 R R R R R R E2 E2 E2. ogous frequency were noted in its repertoire. chaffinch males is reflected in Table 1. (they number more than 20). Fig. 3. 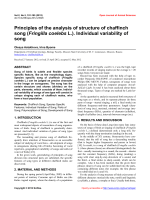 Principles for distinguishing single type songs recorded in different chaffinch populations. (a) Song type A (variants A5 and A6). (b) Song types I (variants I2 and I3). cussed in many works [14, 16вЂ“18]. nevertheless revealed. Table 2 shows the results. nestlings mix melodies of many males in their song. maximal number of song types: 6.
ation when selecting songs of one male on the average n > 20.
numbers in the ascending order. record in the environs of the Fringilla biostation: song type E2, song type M1), mixed song type EM (Lesnoi settlement). be presented in the following works. ing valuable counsels when analyzing the material. 49173 a and 07 04 00609 a). Variability of Functional Load of a Bird Song, Vestn. Mosk. Univ., Ser. Biol., 1994, no. 3, pp. 40вЂ“42. Themes and Variation, Cambridge, 2008.
gilla coelebs, Ibis, 1952, vol. 98, pp. 458вЂ“472. Condor, 1980, vol. 82, pp. 285вЂ“290. 1980, vol. 11, pp. 143вЂ“177. 1982, vol. 79, pp. 126вЂ“152. 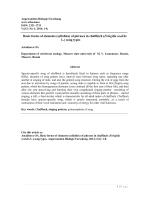 uals, Behaviour, 1980, vol. 75, pp. 207вЂ“218. 1983, vol. 88, no. 1, pp. 15вЂ“27. as a Language, Ibis, 1956, vol. 98, pp. 231вЂ“261. dor, 1975, vol. 77, pp. 385вЂ“406. Acoustic Communication in Birds. Vol. 2, Kroodsm, D.E. and Miller, E.H., Eds., New York, 1982, pp. 147вЂ“208. Behav., 2000, vol. 59, pp. 1187вЂ“1197.